This actual hosting website web template is cool and this is undoubtedly a fact. This hosting domains website design that can be used to get started with an online site for hosting packages , cloud web server hosting or internet hosting. In general, the theme conveys the feeling of a consistent solution you can use for a site that is worth customers' trust. The responsive layout will have your project within reach, from owners of smartphones to people surfing the Internet by means of desktop computers. By selecting this web layout you will be able to provide your site visitors with a reliable website. Besides, ordering this particular website design you get 24/7 support and detailed guidelines. Make use of this web template to amplify your targeted traffic and gain more income in the short term. Parallax effect is a technique in web design where your background content shifts less quickly than the foreground. Parallax scrolling will help you add details to your site look. Responsive design renders a web site page exact same nicely on any display screen size. Responsive design might help your internet site appear equally well on screen of any specific desktop or portable gadget. What will I see instead of the images after installation of the Computers website design template? After Computers website design template installation you will see blurred images included for demo purposes only. Can I get the Hosting Domains website template in higher resolution to use for printing? No, we design Hosting Company web templates optimized for web resolution only. What are the advantages of purchasing a Hosting Provider web template? 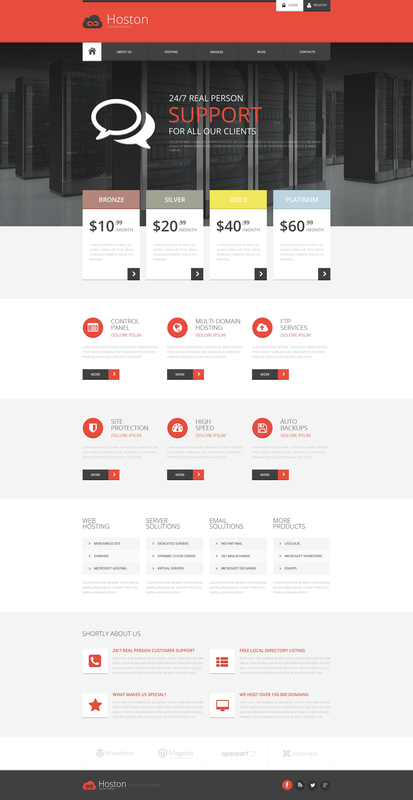 The major advantage of purchasing a Hosting Provider web template is price: You get a high quality design for just $20-$70. You don't have to hire a web designer or web design studio. Second advantage is time frame: It usually takes 5-15 days for a good designer to produce a web page of such quality. In what cases I don't need the extended license for website templates for Cloud Web Server Hosting? Can I use graphics from web template for Computers & Internet I purchased for use in printing? Yes, it's not prohibited to use the web template for Computers & Internet graphics for printed material, but the resolution of the templates graphics ( except for logo templates) is not enough for printing. Are your web templates for Computers & Internet Blogcompatible with any CMS? Can I resell the website design templates for Hosting Domains I bought the extended license for? No, you cannot resell the website design templates for Hosting Domains as is. You can only sell them as the integral part of your new product. What is Developers License for website design template for Cloud Web Hosting Services? If you purchase a Developer's license, you are granted a non-exclusive permission to use the website design template for Cloud Web Hosting Services on up to 5 domains for projects belonging to either you or your client. Is it possible to reactivate my download link for website template for Server Hosting if it was deactivated after 3 days? Yes. Please re-activate the download link for website template for Server Hosting within your account under the Downloads tab or contact our billing department directly regarding that. Will TemplateMonster help me to install my website template for Hosting? Some of our products like osCommerce templates, Zen Cart templates, etc. require installation to operate. Installation services are not included in the package price. TemplateMonster though offers you a variety of sources to help you with installation of your website template for Hosting including installation instructions, some articles with our Online Help Center. Our Knowledgebase contains customers questions and most frequent problems. Anyway, you can always refer to our partners from TemplateTuning.com to install your website template for Hosting for you for a small fee. How many applications, programs etc can I use to integrate with the website designs for Server Hosting under one extended license? The extended license gives you the right to use the purchased website designs for Server Hosting for the integration with one software/freeware/application/CMS/sitebuilder only. In case you would like to use the template with the other application, the other license is to be acquired. Are there any restrictions for using imagery, cliparts and fonts from the Internet website design template I purchased? All imagery, clipart and fonts used in Internet website design template are royalty-free, if not stated otherwise on the product page, and are the integral part of our products. One Time Usage License and Developers License give you the right to use images, clipart and fonts only as a part of the website you build using your template. You can use imagery, clipart and fonts to develop one project only. Any kind of separate usage or distribution is strictly prohibited. Can I resell Computers & Internet Store website templates I bought the developers license for? You cannot resell the customized Hosting Provider web template as a template, but you may sell it as a project to your client. Are there any discounts if I'm buying over 10, 20, 30 or more website design for Computers? Please email to marketing@templatemonster.com with your inquiries about Computers & Internet Company website templates. Is it reasonable to make unique purchase of web template for Cloud Web Server Hosting that was already purchased before? Yes, it's reasonable to make a unique purchase of web template for Cloud Web Server Hosting. Because there is very small chance that you will find the same design on the net. There are more than 3,000,000,000 webpages online now according to statistics on www.google.com. Is it possible to buy the particular image from the website template for Server Provider Company? No. According to our Terms and Conditions we never sell the images separately from Computers & Internet Company website templates (as well as the templates separately from the images). Can I put a line at the bottom (or any other spot) of my new product "Website development by Company name" after purchasing website template for Hosting Provider ? Yes, you can place a note at the bottom (or any other spot) of my product "Website development by Company name". Nevertheless, you cannot place "Website design by Company name" while using one of website template for Hosting Provider . Can I put a line at the bottom ( or any other spot) of the customized web template for Computers & Internet Company "Website design by Company name"? No, you cannot place a line at the bottom ( or any other spot) of the customized web template for Computers & Internet Company saying "Website design by Company name". Nevertheless, you can place "Customized by Company name". What am I allowed and not allowed to do with the website designs for Computers & Internet Company? You may: Build a website using the Computers website design template in any way you like.You may not:Resell or redistribute templates (like we do).Claim intellectual or exclusive ownership to any of our products, modified or unmodified. All products are property of content providing companies and individuals.Make more than one project using the same template (you have to purchase the same template once more in order to make another project with the same design). Is it possible to use your website designs for Server Hosting to develop websites for my customers? Yes. It is perfect for designers who want to offer their customers a high-quality design and also save time and money. Keep in mind that when you purchase the Hosting Services website design with ordinary or exclusive license you're entitled to create only one project (one domain name). Will the website design template for Computers & Internet Store be deleted from TemplateMonster database? No, the website design template for Computers & Internet Store will not be deleted from TemplateMonster database. What is Extended License for website design template for Hosting Domains? Do you provide any scripts with your web templates for Hosting Provider or could you do some custom programming? Our templates do not include any additional scripts. Newsletter subscriptions, search fields, forums, image galleries (in HTML versions of Flash products) are inactive. Basic scripts can be easily added to a web template for Computers & Internet Company at www.TemplateTuning.com If you are not sure that the element you're interested in is active please contact our Support Chat for clarification. I like the image from the website template for Server Provider Company and would like to use it for my advertising campaign, can you send me this image in a higher resolution? No, we can't provide image in higher size or resolution rather than it is on the website template for Server Provider Company. We recommend looking for professional images on online photo resources. Is it possible that Template Monster will contact my client which website I made from Template Monster's website web template for Cloud Web Server Hosting? Yes, our legal department checks licenses regularly. In case we won't find designer's contact information on the site which was made from the web template for Cloud Web Server Hosting of ours we will contact the owner of the site directly. How can I modify website template for Hosting Podcasts to suit my particular website? Please visit our Online Help Center to obtain detailed instructions on editing website template for Hosting Podcasts . Perfect, is the best provider of templates and webs in all internet. I use your services many years, excellente warranty, very fast, every template have the best compatibility anand qualitty, the products are the first class, and when think in buy templates are my first choice. This template has been very useful, great design and pictures. Many pages to customize and useful pictures to use in my project. Responsive and great looking in many devices such as netbook, tablet and phone. Good use of icons and great combination of colors and images. Useful for Web-hosting or other digital services. Hello, I am very satisfied with the purchase, with the template and the service. Everything works great. Thank you.